Chondrification is the process by which cartilage is formed from condensed mesenchyme tissue. The division of cells within cartilage occurs very slowly. Articular cartilage function is dependent on the molecular composition of its extracellular matrix (ECM). The remodeling of cartilage is predominantly affected by changes and rearrangements of the collagen matrix in response to forces experienced by the cartilage. Cartilage growth mainly refers to matrix deposition, but can include both growth and remodeling of the extracellular matrix. collagen matrix: The most abundant protein in the human body and accounts for 90% of bone matrix protein content. mesenchyme: Undifferentiated cells of the early embryo are able to develop into the different tisue types, including bone and cartilage. chondrocyte: A cell that makes up the tissue of cartilage. chondrification: The process by which cartilage is formed from condensed mesenchyme tissue. Chondrification (also known as chondrogenesis) is the process by which cartilage is formed from condensed mesenchyme tissue. 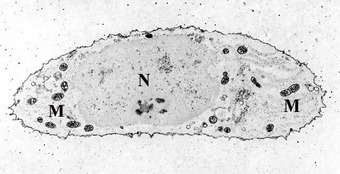 A chondrocyte: A chondrocyte, stained for calcium, showing its nucleus (N) and mitochondria (M). Mesenchyme tissue differentiates into chondroblasts and begins secreting the molecules that form the extracellular matrix (ECM). Mesenchymal stem cells (MSCs) are undifferentiated, meaning they can give rise to different cell types. Under the appropriate conditions and at sites of cartilage formation, they are referred to as chondrogenic cells. During cartilage formation, undifferentiated MSCs are highly proliferative and form dense aggregates of chondrogenic cells at the center of chondrification. These condrogenic cells then differentiate to chondroblasts, which will then synthesize the cartilage ECM. Cartilage: Hyaline cartilage showing chondrocytes and organelles, lacunae and matrix. The extracellular matrix consists of ground substance (proteoglycans and glycosaminoglycans) and associated fibers, such as collagen. 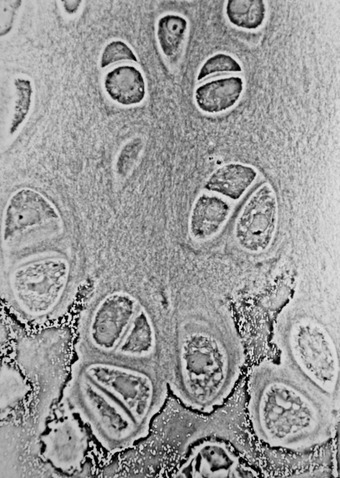 The chondroblasts then trap themselves in lacunae, small spaces that are no longer in contact with the newly created matrix and contain extracellular fluid. The chondroblast is now a chondrocyte, which is usually inactive but can still secrete and degrade the matrix depending on the conditions. The majority of body cartilage is synthesized from chondroblasts that are largely inactive at later developmental stages compared to earlier years (pre-pubescence). The division of cells within cartilage occurs very slowly. Therefore, growth in cartilage is usually not based on an increase in size or mass of the cartilage itself. Remodeling of cartilage is predominantly affected by changes and rearrangements of the collagen matrix, which responds to tensile and compressive forces experienced by the cartilage. Cartilage growth thus mainly refers to matrix deposition, but can include both growth and remodeling of the ECM. Early in fetal development, the greater part of the skeleton is cartilaginous. This temporary cartilage is gradually replaced by bone (endochondral ossification), a process that ends at puberty. In contrast, the cartilage in the joints remains permanently unossified during life. Once damaged, cartilage has limited repair capabilities because chondrocytes are bound in lacunae and cannot migrate to damaged areas. Also, because cartilage does not have a blood supply, the deposition of new matrix is slow. Damaged hyaline cartilage is usually replaced by fibrocartilage scar tissue. Over the last few years, surgeons and scientists have elaborated a series of cartilage repair procedures that help to postpone the need for joint replacement. These include marrow stimulation techniques, including surgeries, stem cell injections, and grafting of cartilage into damaged areas. However, due to the extremely slow growth of cartilage and its avascular properties, regeneration and growth of cartilage post-injury is still very slow.